The Autonomous Vehicle Simulator (AVS) is the future car experience. Created in response to intensive global research, it identified the brand experiences that people want when they no longer need to drive. It is a place that knows its passengers, what they like, what they want and what they need. It’s a time machine that gives back all those wasted hours driving a car. Designed from the inside-out, the AVS is a fully holistic, integrated physical and digital experience. The Definitive Autonomous Car Experience studied the future city and the urban landscape, demographic shifts, technology roadmaps and evolving user behaviors. It synthesized a unique set of high-value opportunities that generated hundreds of new patents for Ford. 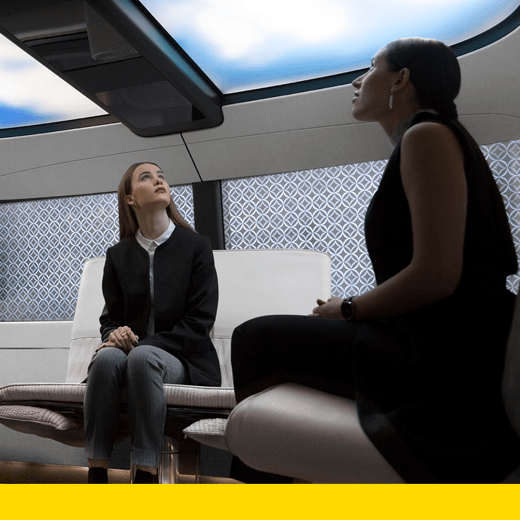 These innovations included connected applications, projected image HMI, transparent contextual displays, mechanical engineering invention, and highly tailored touch and voice control that reaffirms the brand presence and enables a premium end-to-end experience. Designed by: Native Design for Ford Motor Co.